Sunshine Key RV Resort and Marina is big. FACT! When you think of a campsite or RV site, you will no doubt think of a few tents scattered around, whilst the majority of spaces are taken up by huge recreational vehicles. All of them hooked up to the nearest electrical supply, with all the mod cons that you savour at home at their fingertips. Not so much camping as dragging your home with you. At Sunshine Key that image might be slightly different as the quaint and picturesque image of camping under the Florida Keys is blown out of the water by a site that take up an entire Florida Keys key...Ohio Key to be precise. If you are planning to come to this campsite, I have tried to detail as much of the information that you will need to decide on a visit, and I will leave my personal opinion on the place to myself. But to let you into my feelings of Sunshine Key, if I am going to stay in a city then I would choose New York, or Los Angeles instead. Where Can I Find Sunshine Key RV Resort and Marina? As we said previously the site is to be found at Ohio Key which is one the islands that make up the Lower Florida Keys. If you are driving down the Overseas Highway or US1 as it is also known, then look out for Mile marker 39. These are the guide markers which tell you how far you need to go to get to Mile Marker 0 which is down at Key West. One little bit of advice if you are looking for Sunshine Key and you find that the numbers are going up further than 39 then you are going the wrong way. I have heard of horror stories about people confused as to this simple fact. So getting back to where to find the site, if you look at the map below, the Key between Missouri Key and Bahia Honda Key sits on Sunshine Key. 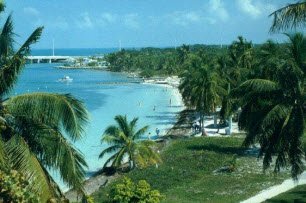 Bahia Honda is the home of the world's most fantastic beach. And that my friends is one reason that this campsite is so busy most of the time. Bahia Honda drags people from across the globe such is its beauty. How Many Sites Does This RV Resort and Marina have? It has nearly 400 sites, which although I made my comment about visiting a city, the place does still have a friendly charm all of its own. With kids running around and people barbecuing and eating outside their areas, and families enjoying the lovely Florida Keys weather together, it isn't hard to get forget the bad bits about this camp. 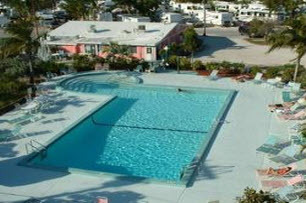 What is at Sunshine Key RV Resort and Marina For Me And my Family To Enjoy? The facilities at the resort are good and will be able to cater for the majority of things that you and your family will be interested in. Spread over 75 acres, the site provides all the amenities that a family or lone camper would require, and a lot that perhaps they wouldn't have thought of. So to make the most of what the park has to offer set your alarm and get up extra early for a game of tennis, followed by a dip in the heated swimming pool. Once that is over then it's a quick game of horseshoe, then volleyball, and if you still have energy left to burn the clubhouse always has a full programme of activities to keep you burning up those calories. However, if you fancy something a little more leisurely then the site even has its own fishing pier situated within the large marina. Pop down to the bait and tackle shop, and then spend a bountifully and peaceful day trying to catch that nights dinner. If of course you fail spectacularly and the fish laugh at you from beneath the water, you can always stroll over the clubhouse and buy dinner instead. For the children there is a games room, basketball courts, a playground and of course loads of water sports to keep them out of your hair whilst you relax in the Florida Keys sunshine. What Can I Do And See Nearby Sunshine Key RV Resort and Marina? Well of course the main attraction that will have you leaving your tv and power flush toilet is Bahia Honda State Park. This is generally known as the finest beach in the whole of America and it certainly is a good one. And remember if you fancy a night under the stars at a different location than at this resort, then you can also camp here. Bahia Honda State Park..Come On A Little Bit Impressed?? The other place worth visiting is the National Key Deer refuge, which is only a short drive and has provided a safe place for the small and attractive Key Deer to climb their way back from near extinction. The kids will certainly love this place. The others attractions worth looking out for are as follows, but note that Big Pine Key and Ohio Key are renown for a place to get away from your normal and life and get closer to nature and the great outdoors. Rates are based on two adults and children under the age of 12.